Hawaii is the newest state that has been added to the 50 U.S states and also the only one that is made up entirely of islands. It occupies most of the archipelago in the Central Pacific Ocean. It is a beautiful land with warm tropical climate, inviting waters and waves and the active volcanoes make it a popular destination tourists, surfers, biologists, and volcanologists. Hawaii has some of the best beaches in the world. These places are accessible by a helicopter or watercraft! The Lanikai Beach in Oahu is considered by many locals to be the best swimming beach. Lanikai’s clear waters, wide beach, and swaying coconut palms add onto the ecstatic beauty of the area. A mile long stretch of “powdered sugar” is perfect for those who seek to sunbathe. The sparkling blue water sheltered by a wide, protective offshore reef provides an ideal swimming condition. Popular activities in Lanikai are kayaking, sailing, surfing, outrigger canoeing, and windsurfing. With the twin Mokula islands at a distance, the beach truly lives up to its translated name of “heavenly sea”. Another beach in the same place is the Hanauma Beach in Oahu was formed thousands of years ago by the flooding of a volcanic crater. This circular bay is home to an amazingly diverse population of fish life. It has a rich marine life and is most visited by tourists who love scuba diving and snorkeling. The Hanalei Bay Beach in Kauai is the most beautiful beach setting among all the islands in Hawaii. 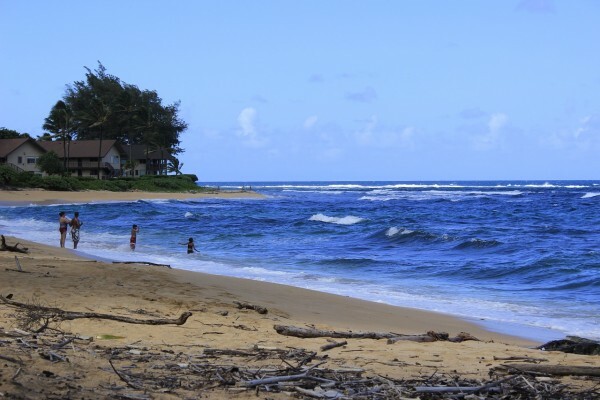 It is located on Kauai’s North Shore and is the largest bay on the island. The beach has a perfect semi- circle of white sand. It is two miles long and 125 foot wide, and bordering to the east is the Hanalei River and to the west is the Waipa River. There are large coral reefs at both the ends of the bay. The bay is very popular among the surfers. There is a public boat ramp and pier of 300 foot long, which is ideal for fishing and swimming. The Kannapali Black Rock Beach in Maui has many names attached to it, for some reason. It is famously known as Keka’s Beach, Canoe Beach, and Dig Me Beach! It is truly a paradise for watersports. There are many water activities that you can indulge in. Snorkeling, kayaking, water scooters and scuba diving are outstanding here. The Black rock is a large lava rock which divides the beach. It is a busy popular area that fronts two resorts. Apart from this, you can also indulge in shopping some exquisite stuff here. The Hulopoe Beach in Lanai was known as a “Pineapple Island”. The fruit has been grown by several decades by a company called Dole. This is now a remote and a secluded holiday destination for people who wish to honeymoon in the area. The Hulopoe Beach Park is an exquisite beach at the head of the Hulopoe Bay. The line of the shore is quite steep, which makes it excellent for swimming. This island is the best snorkeling area among all the islands in Hawaii, due to the colorful variety of fish and clear water. This place is a part of the marine life conservation district, so fishing is banned here.